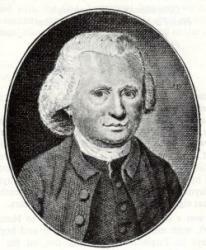 Thomas Olivers was born in Tregonan, Montgomeryshire, in 1725. His youth was one of profligacy, but under the ministry of Whitefield, he was led to a change of life. He was for a time apprenticed to a shoemaker, and followed his trade in several places. In 1763, John Wesley engaged him as an assistant; and for twenty-five years he performed the duties of an itinerant ministry. During the latter portion of his life he was dependent on a pension granted him by the Wesleyan Conference. He died in 1799. --Annotations of the Hymnal, Charles Hutchins, M.A., 1872. Olivers, Thomas, was born at Tregynon, near Newtown, Montgomeryshire, in 1725. His father's death, when the son was only four years of age, followed by that of the mother shortly afterwards, caused him to be passed on to the care of one relative after another, by whom he was brought up in a somewhat careless manner, and with little education. He was apprenticed to a shoemaker. His youth was one of great ungodliness, through which at the age of 18 he was compelled to leave his native place. He journeyed to Shrewsbury, Wrexham, and Bristol, miserably poor and very wretched. At Bristol he heard G. Whitefield preach from the text "Is not this a brand plucked out of the fire?" That sermon turned the whole current of his life, and he became a decided Christian. His intention at the first was to join the followers of Whitefield, but being discouraged from doing so by one of Whitefield's preachers, he subsequently joined the Methodist Society at Bradford-on-Avon. At that town, where he purposed carrying on his business of shoemaking, he met John Wesley, who, recognising in him both ability and zeal, engaged him as one of his preachers. Olivers joined Wesley at once, and proceeded as an evangelist to Cornwall. This was on Oct. 1, 1753. He continued his work till his death, which took place suddenly in London, in March 1799. He was buried in Wesley's tomb in the City Road Chapel burying ground, London. Olivers was for some time co-editor with J. Wesley of the Arminian Magazine, but his lack of education unfitted him for the work. As the author of the tune Helmsley, and of the hymn “The God of Abraham praise," he is widely known. He also wrote “Come Immortal King of glory;" and "O Thou God of my salvation," whilst residing at Chester; and an Elegy on the death of John Wesley. His hymns and the Elegy were reprinted (with a Memoir by the Rev. J. Kirk) by D. Sedgwick, in 1868.